Video Converter for Mac is a really helpful and self-explanatory tool for converting almost all videos like TV shows (*.tp, *.ts, *.trp, etc), 4K UHD videos (4K MP4, H.264/MPEG-4 AVC, XAVC/XAVC S, H.265/HEVC, 4K TS, 4K MXF, 4K MTS, 4K M2TS, 4K MKV, 4K AVI, 4K MOV, 4K FLV and 4K WebM), 1080p/1080i/720p HD, AVCHD, AVCHD Lite videos (*.mod, *.tod, *.m2ts, *.evo, *.mts, etc) from DVs or camcorders (JVC, Panasonic, Canon, Sony, etc), DVDs (*.vob), YouTube videos (*.flv, *.f4v), common videos (*.avi, *.mxf, *.vp6, *.mov, *.mkv, *.dts-hd, *.truehd, etc.) and even the popular GoPro or Flip Video/Flip HD Video(*.mp4), Canon EOS MOV (*.mov), Kodak MOV and Nikon MOV (*.mov), etc to Apple ProRes 422, ProRes 4444, DVCPROHD, Apple Intermediate Codec (AIC), Avid DNxHD (*.mov), AVC MOV, DV, AVI, MKV, MP4, H.264/AVC, MPG, MPEG, MP3, AAC, AC3, etc with pristine quality. And it converts video to 3D formats in Anaglyph/Side by Side/Top and Bottom. With this Mac Video Converter, you can enjoy tons of videos on your iPad Pro/Air 3/2 or Mini 4/3/2, iPhone 7 (Plus)/iPhone 6S (Plus), iPod Touch 6g/5g/4g, HTC 10, HTC One M9, PSP/PS4, XboX 720/360, Apple TV 3, WD TV, Samsung Galaxy S8/S7/S6/S5, Google Nexus 7 2, Kindle Fire, Nook Tablet, cell phones and so on, or edit them in Adobe Premiere Pro, Final Cut Pro 6/7/X, FCE, Avid, iMovie, etc, or insert to PPT for presentation; or even upload to YouTube, websites for sharing. * Support 4K UHD, AVCHD, AVCHD Lite, XAVC (S), H.265/HEVC MXF, DVR365(*.dav), Canon MOV, Nikon/Kodak MOV, GoPro/Flip MP4, etc. * Transcode any video to Apple ProRes, AIC, HDV, Avid DNxHD, etc on Mac. * Convert 2D videos to 3D format with multiple 3D options. * Convert AVI, WMV, MP4, MOV, MOD, TOD, DV, M4V, FLV, MXF etc any HD/SD video on Mac. * Import video to iMovie, FCE, FCP, iDVD, iPad, iPhone, Kindle Fire, Nexus 7, etc on Mac. * Edit video: Clip, Crop, Merge, Apply Effect, Set Output Parameter, Snapshot, etc. 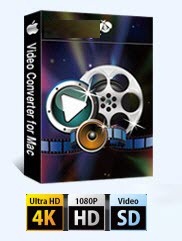 Video converter mac supports convert common video between avi, wmv, divx, xvid, wmv, mp4, , mov, dv, mpg, mpeg-2, mpeg-4, h.264, 3gp/3g2, rm/rmvb, vob, mkv, swf, flv, asf etc on Mac os x.
Mac video converter also supports convert kodak mov, flip mp4, canon mov, nikon mov, tod, mod, avchd, hd avi, hd wmv, hd mov, hd mp4, MXF, etc video on Mac. Mac video software can import any video to iMovie, Final Cut Pro, FCP X, Final Cut Express, Quicktime, iTunes, Adobe Premiere Pro, pinnacle studio, iDVD etc on Mac. Video converting tool mac can transfer video to iPad, iPad2, iPad 3, iPad Mini, iPod Touch 4g, iPhone 4/4s/5, Apple TV 3, Transformer Pad TF300, Tablet S, Galaxy Tab, Google Nexus 7 Tablet, Galaxy Note, Kindle Fire HD, Galaxy Note 2, Galaxy S III, PSP, BlackBerry, Creative Zen, iRiver, Zune, Palm, cell phone on mac os x.
Mac movie converter supports convert any videos to Flash SWF and FLV, RM or WMV movies for upload to Facebook, Youtube etc metacafe on Mac. 4K MXF, 4K MKV, 4K MOV, 4K MP4, 4K AVI, 4K FLV, 4K MTS, 4K M2TS, AVI, MPEG, WMV, MP4, FLV, DivX, XviD, MOV, H.265/HEVC, XAVC/XAVC S, MXF, TS TiVo, TiVo, QT, DVR365 videos (*.dav), VRO, MXF, MKV, EVO, DivX, XviD, AVI, MPEG, WMV, FLV, H.264/MPEG-4, MOV, RM, RMVB, ASF, H.263, H.264/AVC, MPEG-2, MPEG-4, M2V, TP, MVE, VDR, TRP, HDV, DVCPRO, NUV, MVI, DV, DVR-MS, VP6, DIF, MJPEG, MJPG, MPV, NSV, NSF, VC-1, DAT, NUT, OGM, GXF, TS, YUV, AVCHD Video (*.mts, *.m2ts), MOD, TOD, H.264/MPEG-4 AVC (*.mp4), MPEG-2 HD Video (*.mpg, *.mpeg), MKV HD Video, MPEG-2 TS HD Video (*.ts), QuickTime HD Video (*.mov), WMV HD Video (*.xwmv), Audio-Video Interleaved HD Video (*.avi), HD Pocket Camcorder Video (*.mp4), Flip camera HD video (*.mp4), etc. TrueHD, DTS-HD, DTS-MA, Eac3, DTS, MP3, WMA, CAF, AAC, WAV, CDA, OGG, FLAC, APE, CUE, RA, RAM, M4A, MP2, AIFF, AC3, AU, SUN AU, MPA, etc. Apple ProRes for FCP(FCP 6 or above is required), DVCPROHD, HDV series format (*.MOV), Apple Intermediate Codec (AIC), DV-PAL/NTSC, DVCPRO-PAL/NTSC, DVCPRO50-PAL/NTSC, Avid DNxHD (*.mov), H.264/MPEG-4 AVC (*.mp4), HD Videos, MPEG TS HD Video (*.ts), QuickTime HD Video (*.mov), H.264 HD video (*.mov), WMV HD Video (*.wmv), AVI, MPEG, WMV, MP4, FLV, DivX, XviD, MOV, ASF, MPG, 3GP, 3G2, SWF, VOB, TS, DV, Apple DV, F4V, etc. Resolution with 4K (4096×2160 or 3840×2160), 1080i(1920×1080), 1080p(1920×1080), 720p(1280×720). Apple TV/ATV 2/ATV 3, iPad Pro, iPad Air 3/2, iPad Mini 4/3/2, iPhone 4S, iPhone 5, iPhone 6/6 Plus, iPhone 6s/6s Plus, iPhone 7/7 Plus, iPod Touch 5, iPod Touch 6, PS Vita, PSP, PS3, PS4, Xbox 360, Xbox 720, Microsoft Surface Tablet, Google Nexus 7 Tablet, Samsung Galaxy Tab/Galaxy Tab 2/3/4/5, Samsung Galaxy S8/S7/S6/S5, Galaxy Note 6/5/4/2, HTC 10, HTC One M9/M8, Asus PadFone, Transformer Pad TF300, Nook Tablet, Kindle Fire, Asus Eee Pad Transformer, Eee Pad Transformer Prime, WD TV, TviX, NMT Popcorn Hour, HDTV, QuickTime Player, VLC, iTunes, etc. * Mac OS X (including MAC OS X 10.4, Mac OS X 10.5 Leopard, 10.6 Snow Leopard, Mac OS X 10.7 Lion, Mac OS X 10.8 Mountain Lion, Mac OS X 10.9 Mavericks, Mac OS X 10.10 Yosemite, Mac OS X 10.11 EI Capitan, macOS 10.12 Sierra, macOS 10.13 High Sierra) on iMac, MacBook, Mac Pro, MacBook Air, MacBook Pro, etc.